Perlman Leadership Council 2019 – All Weekend. All Year. All Life. Recently, most of the Perlman Leadership Council (PLC) met for a fun weekend of learning and discussion in DC. 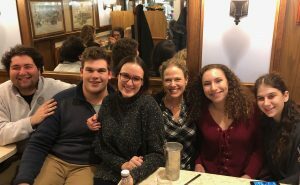 Lily Sokobin, Maya Tipiere, Charlie Greenblatt, Tori Isaacson and I (as well as Marci Brustman who is having the time of her life studying abroad in Europe!) are SO excited to be back as staff members at Perlman for a third year and can’t wait to see the new challenges and opportunities that await. We began the weekend with a beautiful Shabbat service and dinner at the historic Sixth & I Synagogue in downtown DC. This was a great chance for us to get settled into the weekend with Candice and catch each other up on all the exciting news from our lives. The service itself was really unique and it was just so great to be back with some of our favorite people together. After the service, we had a great discussion sharing and reflecting on our own Jewish traditions. On Saturday, we began with breakfast downtown before taking the time to explore the Smithsonian American History Museum. We compared the exhibit about artifacts throughout American history with milestones of Judaism in America, as well as introducing our own personal artifacts that represent something meaningful about our own individual Jewish identity. After some time off and a great song session courtesy of a random street performer outside the museum, we visited the Hirshhorn Art Museum. We explored the exhibit “Pulse” which is a one-of-a-kind experience put together with our fingerprints and heartbeats. We discussed how our Jewish heartbeat has affected our journeys through life, and the moments that have shaped our Jewish journeys. We took a brief moment after this to decompress and explore DC a little, finding ourselves outside a Psychic in Chinatown. All five of us got our palms read, and I don’t want to reveal too much but I can say for certain that this summer is going to be incredible! From there we made our way out to Candice’s house where we had a fantastic Israeli dinner along with Rachel and Freshmore division leader Aaron Berner. We chatted about our role with camp and what we can do going forward to make camp the best it can be at all times, both for the campers and our fellow staff. On Sunday morning we had breakfast with Candice and Perlman parent and board member Rebecca Kotok and discussed diversity and the importance of recognizing the impact of someone’s background and how that is important in bringing people together. Finally, we set goals for what we want to accomplish this summer before departing, starting the countdown until we see each other in just 86 days!